Someone in the church had received an invitation leaflet for an open day at the mosque. It mentioned that there would be the opportunity to see around the building and also to listen to a talk about Mary and Jesus. Philip and the church have been praying for some opportunity to make contact with the (large) Muslim community around them. This seemed too good an opportunity to miss. Half a dozen folk from the church agreed that they would accept the invitation. So off we went. 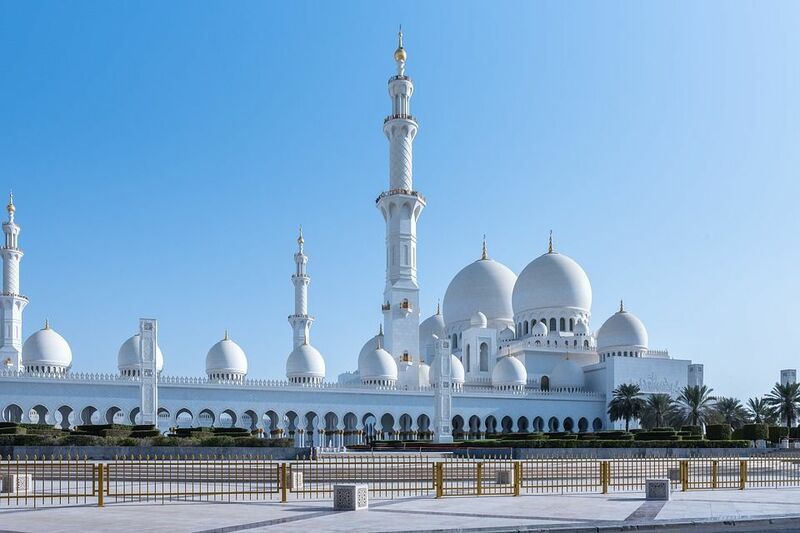 Some mosques are grand, towering buildings with minarets and domes. This mosque had none of that purpose-built splendour – it had clearly been designed for another purpose, perhaps as an office building or a community centre. Two or three traditionally dressed Muslim men were outside welcoming visitors. They shook hands with us and smiling, ushered us through the door. We found ourselves in a foyer. The noticeboards advertised all sorts of community activities, open to all. A community centre, a nursery, a pre-school, a full time primary school (with 160 pupils), a youth club, various health projects, a scout group: all of these are run by the mosque through a charitable trust. It organises separate swimming sessions for men and women, a debating club for girls, a dressmaking class for women, tea clubs for men and women. And much much more. As far as I could make out, all these activities are open to Muslims and non-Muslims alike. “Should we take off our shoes?” I asked. “No, no, no” said our guide. “Only in the prayer room”. He led us on into a large hall with a high ceiling. It might have been a gym or a warehouse. At the far end were tables behind which women were serving refreshments – the banner above the tables proclaimed that they had on offer a range of organic foods and fruit juices. On our left thirty or so chairs were set out in rows, facing a table. Free-standing display boards covered in attractive posters filled most of the rest of the space. We wandered up and down the displays and examined the posters. Some of them were about the history of Islam – the prophet Mohammed, and the revelation of the Qu’ran. Some of them were about Islamic beliefs – the unity of God, the importance of submitting to his will. Some were about Islamic practice – prayer, pilgrimage, fasting. Some of them were about Islamic values – the importance of education, family life, the role of women, jihad – which the poster stressed, had nothing to do with holy war – it was all about our personal struggle to do Allah’s will, however hard. And some of the posters were about Christian belief. What do Muslims believe about Jesus, about Mary? Do they believe that Jesus was a prophet? Oh yes, a very great prophet. Do they believe in the virgin birth? Yes. Do they believe that Jesus died on the cross? No. We were left to browse the posters. Friendly men stood by to answer any questions we might have and one or two of our group took the opportunity to challenge the Muslim view of Jesus. To us, Jesus is much more than a prophet. We worship him, and we worship God through him. He is our only way to God. Perhaps I should have asked some questions too. I didn’t. I was still thinking about the posters. One way or another they were all spelling out the same message. Islam is not to be feared. It is a reasonable, peaceful, humane religion. Muslims believe in tolerance, they respect women, they promote education and science. Islam and Christianity have very much in common. That was the note I heard in everything that was done that afternoon. We listened to a twenty minute talk by a young woman. She was traditionally dressed in a hijab – a shawl covering the head; not the burkha which covers the face. But she spoke with an unmistakable cockney twang. She was charming, vivacious, eloquent, funny – and at times what she said was very moving. She works for the NHS as a counsellor, available to advise and comfort anyone, Muslim or non-Muslim. Is she there to convert people to Islam? “No, that isn’t my job. I’m there because I’m a human being, and I’m there to help people because they’re human beings”. She’s glad that she was brought up bi-lingual, equally fluent in Urdu and English and that she has a working knowledge of other languages. Why? Because she loves to see patients’ faces light up when they realise that they can communicate with her. She’s passionate about education – she’s working to improve her Arabic because she wants to read the Qu’ran more fluently and get to know the writings of Muslim thinkers. But she values all education. Why does she wear the hijab? Because she wants to. Nobody ever told her to. Her family never encouraged her to. But as a girl she decided she wanted that mark of her identity. She’s free – but her Muslim sisters are equally free not to. There’s no rule about it. It was not a fluent talk – the speaker read from his script in stumbling, heavily-accented English. But again the message came through clearly. The speaker was deeply respectful towards Christianity. The speaker wanted us to know how highly Mary and Jesus are regarded in Islam. Allah gave Mary great honour when he created a child in her womb, though she was a virgin. Adam was created without father or mother. Jesus was created with a mother but no father. Allah enabled Jesus to speak even when he was a baby, so that he could defend his mother. Jesus is a prophet of Allah, indeed the Messiah. Muslims believe in him and honour him. But of course, God is One, and God alone should be worshipped. After the talk there was opportunity for questions. A few folk asked questions, but it was difficult. The speaker had the microphone. It was brought to the questioner and then taken back to the speaker. Questions tended to be short, answers tended to be long. And there was no opportunity for a follow-up question. So there was no way to challenge anything the speaker might say. Philip and I both stayed silent and let others ask the questions. We were allowed to witness a young black man becoming a Muslim. He sat with the leader of the mosque (the imam? the mullah?) and repeated after him in Arabic the vital words, “there is no God but Allah and Mohammed is his prophet”. That is all it takes to become a Muslim. And then the imam reminded him of some Muslim duties – fasting during Ramadan, giving to charity, and so on. And also that if he is a single man he must not sleep with another man’s wife, and that when he is married, he must remain faithful to his wife. I think it was assumed that he would have only one wife. The imam didn’t mention that under Islamic law (though not under British law) he might have many. We were escorted through to the prayer room, leaving our shoes at the door. We walked across the gorgeous carpet and stood respectfully at the front while the leaders showed us a copy of the Qu’ran and explained how it had been given by Allah, and how it had been passed down through the centuries without the alteration of a single word. They talked too about prayer. Prayers in the mosque are said in Arabic. And yes, that means that some people do not understand the words they pray. But that is not ideal. People should understand what they are praying. That is one reason why we want people to learn Arabic. And of course, private prayers may be said in any language. While we were in the mosque, after we had left the prayer-room, one of the set times of prayer was signalled. I went over to the door of the prayer room and looked in. Rows of men were kneeling, chanting the prayers. Are there separate prayer times for women? I don’t know. That’s something I should find out about. But clearly these main prayer times are for men alone. When they emerged, I went over to speak with the man who had given the talk about Mary and Jesus. I asked if he could explain some things to me. “Tell me, is it correct to call Jesus the Son of God”. “No, no. And Jesus (peace be upon him) never said that he was God’s Son” And he began again his lengthy explanation that God is One, and can have no parents, no brother, no son, no equal. “Why did Jesus say that he was the Son of the Blessed One?” I asked. My friend was flummoxed. All he could suggest was that “the Blessed One” was someone other than God (though he had earlier said that Jesus had no father). So I took him to the first verse of Mark’s gospel: “the gospel about Jesus Christ, the Son of God”. He was floundering now. He had said so dogmatically that the New Testament never calls Jesus the Son of God – my guess is that he had never read the New Testament at all. Another of the mosque leaders came to his rescue. He came across, interrupted us, and turned the conversation into safer channels. It was time for us to go in any case. And after saying farewell, and shaking many hands, we left. Since then Philip’s been back – to sit in on a discussion class held on Friday mornings. He’s sat cross-legged on the floor with six or seven Muslim men, listening and occasionally asking a question. Philip wants to reach those men with the good news of Jesus Christ. But he knows that if he’s to do that, there’s a long patient trek ahead. These are men utterly convinced of an all-embracing world-view. They’re men who believe they know what Christianity teaches, and what the Bible says. But all they know about the Bible message is what their propagandists have told them. There are countless misunderstandings and confusions that have to be cleared out of the way before they can begin to understand what the real gospel is. Perhaps their biggest misunderstanding is that they think that all Westerners are Christians. They imagine that you can be born Christian as most of them were born Muslim. So when they see “Christians” boozing, sleeping around, living godless lives, they imagine that Christianity is a lax, undemanding, careless religion. Islam calls for self-discipline, submission, seriousness. “Christians” by contrast don’t have to pray, don’t have to fast, don’t have to restrain their greed… No wonder Muslim dismiss Christianity as having nothing to offer them. Philip and the others have to show them what real Christianity is – a life of dedicated, self-disciplined service to God, but a life too of joyful fellowship with God, made possible by our union with Jesus Christ, the Son of God. How do we view the Muslim folk around us? Do we resent the fact that they are here in this country? That they have brought with them their culture, their way of dress, their values? Do we fear them and avoid them as far as possible? Well, there is a real question about whether it is wise for any country to open its borders and to allow lots of folk from other countries to move in. There are issues about resources, about community, about national identity. I think those issues need to be debated openly and honestly. But whatever I think about the wisdom of our leaders in allowing such widescale immigration, as a Christian surely I can rejoice that God has brought so many people to this country to hear the gospel. And that includes Muslims. We have prayed for many years that missionaries will go and preach the gospel to Muslims in their own countries. Many of those countries are now closed to Christian missionaries. But God is bringing folk from those countries to us. And Christians have the opportunity, lovingly and patiently, to befriend those people and to tell them about Christ. And thank God, there are many Muslims who are finding Christ through the witness of Christian believers across the UK. Many Muslims are willing to talk. That was one thing that came home to me when I visited that mosque. If I try to start a conversation with most indigenous Brits about God or heaven or hell or the way to be saved, it usually runs to the ground within a minute or two. They’re simply not interested in God. They don’t believe he’s important. But the majority of Muslims acknowledge that God is supremely important, and that it’s worth spending time talking about him. That opens up opportunities for us and we must take them. It’s good to be prepared. There in the mosque I felt my inadequacy: how little I know about Islam, about what Muslims believe, about their cultural sensitivities. I’ve read a little of the Qu’ran but not enough to be able to say anything about it. I know so little about the differences between different Muslim groups. That again came out so clearly at the mosque. We hear constantly about radical Muslim groups who are seeking to destroy our society violently. But that clearly is not the message that this mosque is propagating. Which outlook is more true to Mohammed’s message, and the teaching of the Qu’ran? I think I know the answer, but I have to accept that not all Muslims are the same. There are perhaps as many differences between Muslims as there between people who call themselves “Christian”. A good starting-point for folk who want to prepare themselves for witness to Muslims would be E M Hicham’s book, How shall they hear? Sharing your Christian faith with Muslims. It’s published by Ambassador International, and you can order it directly from Hicham’s website: http://emhicham.org/publication.aspx . Many of you know Hicham, so you know that he was brought up as a devoted Muslim in North Africa. If anyone can help us understand what it means to be a Muslim, he can. Philip says that that book has been his greatest help in preparing him to reach Muslims. You’ll find lots of other helpful resources on the website too. Why does God move people around the world? “He determined the times set for them and the exact places where they should live. He did this so that men would seek him and perhaps reach out for him and find him…” (Acts ch 17 vss 26-27). Why has God moved so many Muslims to the UK? Surely it’s so that many of them may find him through Christ. Wouldn’t it be wonderful if we were to play a part in the fulfilment of that great plan? What an excellent insight, and a very noble way to view the circumstances into which God brings us. We are either unwilling or prevented from going to the Muslim in their own countries, so God brings them to us! I employ professional technical staff, and there is no doubt in my mind that the quality of staff from Muslim countries far exceeds that of indigenous Brits or Aussies. Isn’t this a little reminiscent of the crowds that gathered from various countries to Jerusalem to hear Peters sermon on the day of Pentecost?